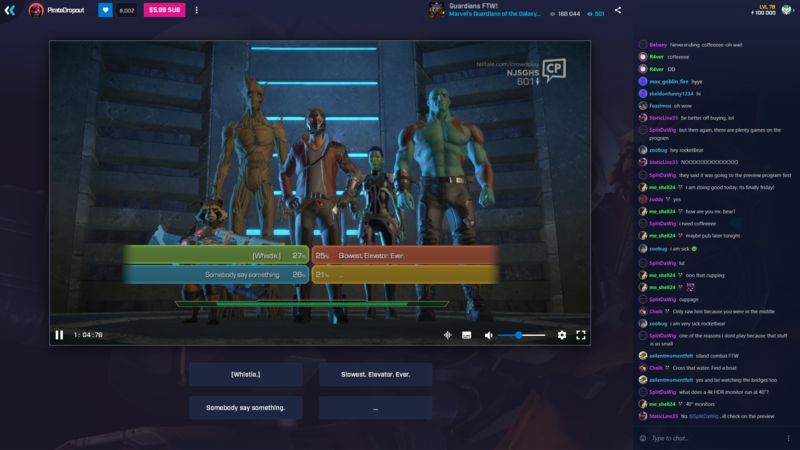 Microsoft has changed the name of its live-streaming platform from Beam to Mixer. The firm says it has made the changes to push the live-streaming platform in territories where it cannot use the Beam name. Mixer, the firm says, reflects the fact the service brings people together. 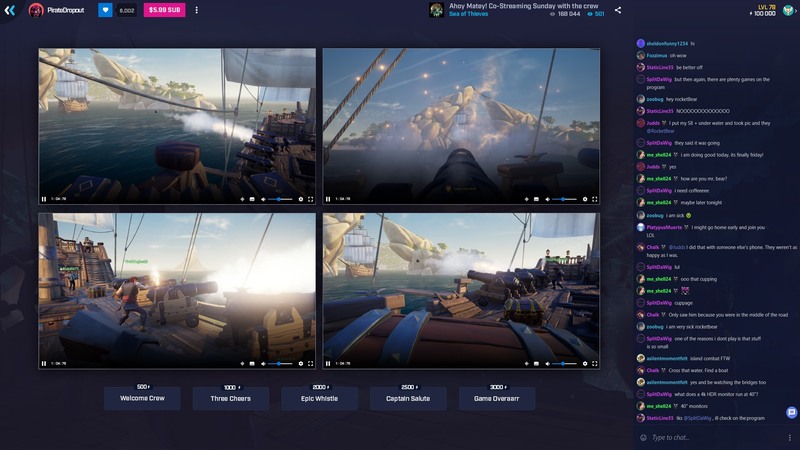 Mixer's big selling point is its faster-than-light low latency, which allows viewers to interact directly with the streamer and the game in real-time. TellTale is incorporating this into some of its games, such as The Walking Dead, Guardians of the Galaxy and Batman, where the audience can crowd-decide what choices are made. As part of the re-brand, Microsoft is also launching a series of new options for Mixer as it attempts to take on Twitch in the lucrative but competitive live-streaming market. 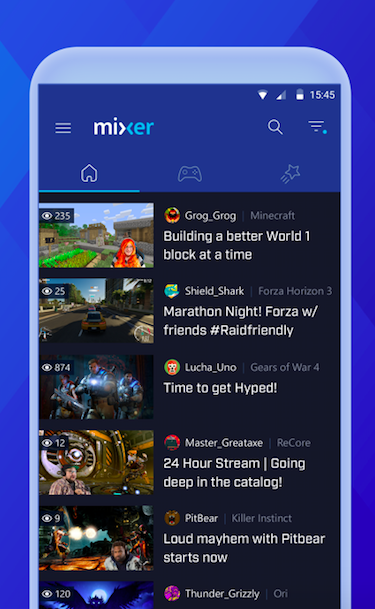 These include extending Mixer to mobile phones (it is currently available on Xbox One and PC), launching a co-streaming option where gamers can now stream next to one another in the same channel, and a dedicated in-house channel called Channel One, which will showcase a variety of content. 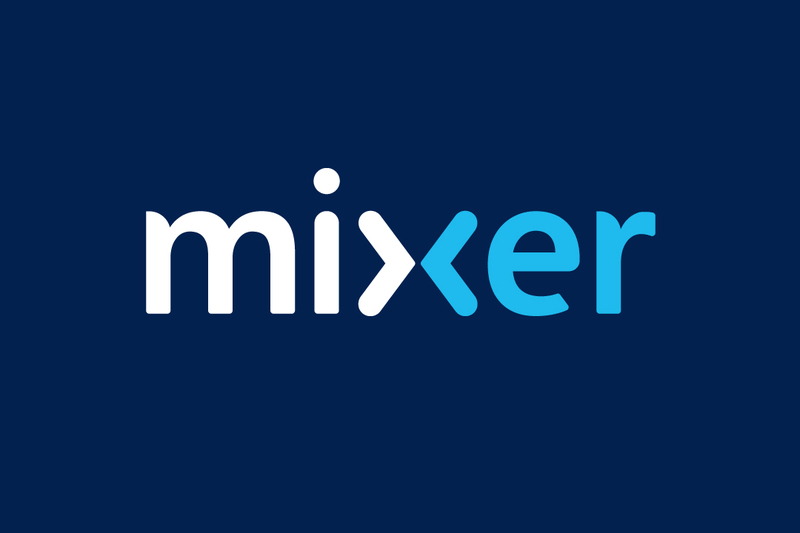 The firm will also now promote Mixer via the Xbox One dashboard, and will be streaming Microsoft's E3 press conference. In addition, the firm has launched a dedicated 'Mixer Studio' in New York for streamers and partners to use. Mixer enters closed Beta on iOS and open beta on Android today. The company is also eyeing other platforms as it tries to catch up with some of its more established competitors. "We're not announcing any new platforms today, but there's no platform that we wouldn't want to be on," Chad Gibson, partner group program manager, tells GamesIndustry.biz. "We don't want to put any barriers behind people wanting to watch it or use it. We will be rolling out to more platforms over time, for sure." The mobile functionality will also allow for co-streaming. This is so viewers can watch streamers - who may be playing the same game - within a single channel. "The idea came from just observing what a lot of streamers do," Gibson says. "A lot of streamers that we've seen will be playing games together and having their different channels. There are a couple of partners on our platform that will be playing Minecraft and building a world together and they will both have independent channels, and viewers will often switch back and forth between the channels. So the way it just naturally works is that their community is split between those two channels... Co-streaming is just a way to allow that to come together where the community isn't separate. "In the case of co-streaming, those two people would join their channels together, the chat gets merged, and their two viewing perspectives will be in the same channel page. So the community that's watching those two guys or girls now has a single place to watch. That streaming will be referenced on both of their individual channels, so they're not losing any opportunity for community growth, but we are now allowing within a single channel a chance to tell a bigger story. "As we went down that path, there was just so many scenarios that this was great for. For example, take the popular game of the moment, Playunknown Battlegrounds, and its four-person squad play. As I have been testing the feature, I am playing with a four-person squad and we all stream together. We join a co-stream and it is the story of our squad in one channel, and that is a really, really powerful thing that we think is going to unlock new types of storytelling and community building." Co-streaming could work well at events such as E3, Gibson says, where multiple users can stream things from their phones. The majority of content on Mixer is game-related, which is unsurprising considering its integration with Xbox. But Gibson observes that this is changing. "The diversity of non-gaming content actually happened faster than I thought," Gibson says. "It is not that I personally had a goal of percentage of game to non-game content, but... a good example of one of our partners is Remi. She reads books, tells stories and occasionally she will play League of Legends. There are a bunch of folks who create art, and we actually have a couple of musicians - BrilliantBuffoons is one, Duke is another. Duke plays the piano and BrilliantBuffoons plays drums, and they take song requests from the audience. Stuff like that is great, and I find that so incredibly engaging, and the low-latency applies so well, because you are having a direct conversation." "I think the market is large enough for everyone to be successful. But we'll focus on the things that are unique about our platform"
The big challenge for Mixer is that it currently lags behind its competitors in terms of pure viewer numbers. The relationship with developers and the tab on the Xbox One dashboard (which will be used to show everything from a Gears of War eSports event to a new streamer) will certainly help, but until it gets a strong number of users, it can't command the same monetisation opportunities for streamers as the likes of Twitch can. Gibson says Mixer is getting there. "The growth has been more than we had anticipated since the Creator's Update [the Windows 10 update that introduced Beam to PC]," Gibson insists. "It has provided us with a whole bunch of new challenges to overcome, but it's been really great. We have surpassed all of our initial goals for that launch." He continues: "We will do everything we can to share this with the world. This is one of the reasons we're doing this, to take it to a larger level. We think the whole market for game video and streaming in general is growing so fast, that I don't think we need to necessarily look at ourselves relative to others to see our own growth success. I think the market is large enough for everyone to be successful. But we'll focus on the things that are unique about our platform, which is great because it allows us to tell our own story and showcase what we are really excited about - which is low-latency, interactivity, co-streaming... all of those capabilities." The involvement of TellTale is certainly a positive move for Mixer as the service looks to integrate into more video games. Mojang is also looking at utilising it in Minecraft - and there are already community-made Minecraft mods that make use of Mixer. Gibson says that the development community is excited by what Mixer can do, but acknowledges the firm needs to make it easier for them to utilise. And it's something the team is committed to, he says. "It has excited and challenged people in terms of how to create a game and make it so the viewing audience can participate," He says. "For some games that is challenging. For a game that has shipped, it's a case of trying to see if there's a content update they can do to add that interactivity, and for some games that is harder. Most of the creative directors we talk to think that the really mind-blowing experiences will only exist when the game is built with this in mind. There are a lot of games where there are very natural ways for us to expand with interactivity. Minecraft is probably my favourite example where there is a bunch of ways, even for modders, to bring interactivity into that game. "Most of the creative directors we talk to think that the really mind-blowing experiences will only exist when the game is built with this in mind"
"But honestly, in terms of feedback, what we're hearing is: "We really think this can make our game more engaging, but we need to be able to trial a lot of things." I am summarising a bunch of feedback, but developers ultimately want us to make it easier for them to try a bunch of things. That made us, with [our last update] Interactivity 2, change our priorities on some things. We prioritised having Unreal and Unity add-ons, because that makes it easier for creative directors and tech directors to prototype. "The excitement has been pretty universal. It has challenged people to figure out how they can apply this to a game that's on the market right now, and motivated people who have games coming in the summer, fall or next year. So throughout all of this, the tactical thing for us is to help make it easier and quicker for them to iterate, prototype and explore what they can do." In terms of technology and potential, Beam - now Mixer - always seemed interesting. The popularity of 'Twitch Plays' showcases a desire for communities to get involved with the things that they're viewing. But Mixer enters into a market that's dominated by Twitch, with growing competitors such as Facebook Live and YouTube - plus other independent outlets like DingIt and Smashcast. So what is Beam's ultimate aim? Is it to augment Microsoft's existing services and offer something that's unique to the Xbox platform, or is it to become a true competitor to Twitch? "A big thing that we obsess about in Xbox Live is how do we make it easier for friends to invite others to play games," Gibson concludes. "We want to make it easy to share things. To us, this service allows us to expand that to the act of watching. Now my friends can watch me play with zero latency and it is just like they are in party chat with me. In the future, when Sea of Thieves, or a new Minecraft or Forza comes out, my viewing audience can actually participate in my game adventure. Be that by giving me challenges, cheering me on, helping me overcome an obstacle... to us it is a great way of extending the game to more people in a conceptually similar way when we moved Xbox Live onto Windows. With that we wanted to expand the Xbox world to more people, and this allows us to expand that even further and offer a whole bunch of great new experiences."